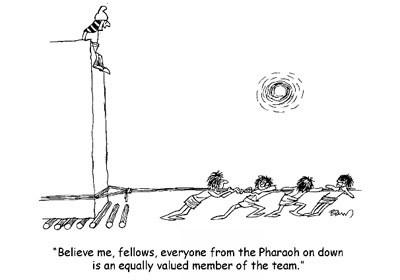 Leaders Lab / Building Teams / Has your team developed a life of its own? When a team, or an organisation, reaches a certain size it begins to have a dynamic of its own, quite different from that of a loose group of individuals – and for managers it can seem as if the skills you’ve learnt about managing yourself, your work and your people, have deserted you. What you’ve probably missed is that there’s been a ‘state change’ in your business. You can no longer sit in the middle of the web, like an all-seeing spider, and manage the individuals. If you try, it’ll be a recipe for chaos and stress. You’ll also permanently restrict the capacity of your business to grow, as you simply can’t manage more than a certain number of people this way. What behaviour is and isn’t acceptable between us? What does it actually mean to ‘be accountable’ anyway? These are all conversations which you and the team should hold together. Negotiate the rules and thrash out solutions which work for everybody. There’s no substitute for creating a clearly defined set of rules and structures for communicating professionally at work – and if you do so, you’ll have better working relationships, because you develop them and you maintain them. This will help your team function well under stress, and stay together through any tensions. What happens to teams under stress? Alignment: the degree to which everyone on the team understands its larger purpose and focuses their actions and those of the team on that objective. Resilience: the degree to which a team can hold itself together, even under severe stress, and remain effective. Energy: the degree to which a team is ambitious, takes the initiative and maintains momentum at a high level over a long period of time. Openness: the degree to which a team engages with the broader organisation and the outside world, and challenges itself to adopt new information and best practice. Efficiency: the degree to which the team optimises resources and time and drives efficiently for results. Balance: the degree to which a team understands the importance of a diversity of skills and strengths, and incorporates members with different experience, knowledge and functional skills. Most teams, in the rush of getting on with the ‘day job’, never discuss these – or only do so when something goes badly wrong! Only when you’ve created a stable platform can you mutually agree actions for moving vital issues and the team forward. Give us a call on 01865 881056 or email us at info@leaderslab.co.uk if this strikes a chord with you.